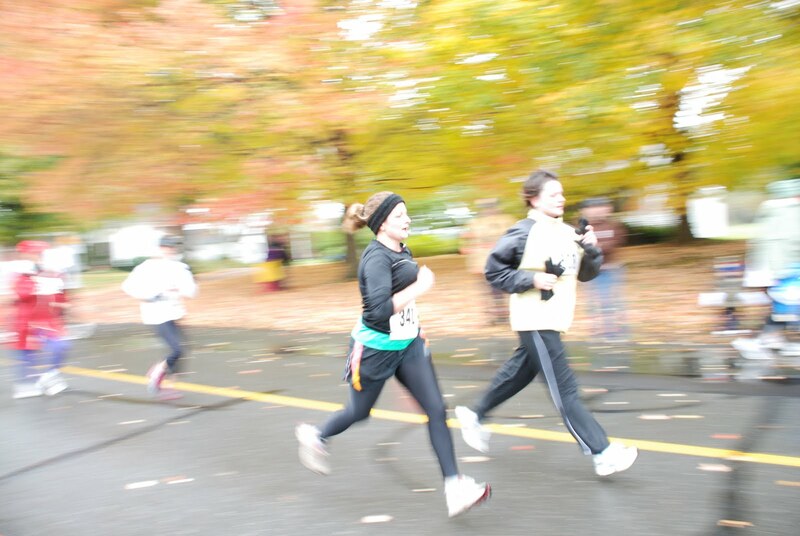 On Sunday I ran a 5k on a very cold, rainy, windy morning. I made myself go- I had already paid the registration fee, and I was meeting two friends there. But I soooo didn’t want to go. I sooo wanted to stay in bed. But I went. I bundled up and I ran. Along with a couple hundred other brave souls, I ran past a 1700s-era cemetery, through muddy fields, and alongside tractors, all the while the wind gusts smacked and rain pelted against my skin. And I crossed the finish line with my fastest time since 2003 (and only 5 seconds off that time, my true personal record). Patrick bundled up too and cheered me on, took pictures, was the great supporter he always is. It made the miserable conditions much more bearable. He even bought me a bagel, soup, and a chai latte at Woodstar afterwards. I’m glad I got out of bed- and glad I got to spend the rest of the day on the couch, under blankets, sipping tea and eating brownies. Good for you! I was going to do that run, but pee-wee football and a leg injury got in the way. The next one for me is the Hot Chocolate Run.